Until recently, Mortimer Menpes (pronounced Mem-pes) (1855-1938) was a shadowy and somewhat forgotten figure in nineteenth- and early twentieth-century Australian art. He was born in Port Adelaide and as a young man was educated in art by teachers such as Wilton Hack and John Hood, possibly at the School of Design, on an informal basis. He then worked in photographic studios as a hand-colourist for Hood and later others, including Townsend Duryea. Only a small sketchbook of portrait drawings, possibly modelled on photographs, survives from those early years. In 1875 he moved to London, shortly after his arrival marrying a young woman, Rosa Grosse, for whom his father was acting as guardian. She had been bequeathed her late father’s estate, and Menpes was thereby able to pursue his interest in art. He furthered his studies at the National Art Training School in South Kensington, where his teacher in printmaking (etching) was Alphonse Legros. He completed his studies in 1879 and started exhibiting professionally in the following year. His life was immediately action packed and colourful and he quickly became associated with the Pre-Raphaelites, their patron John Ruskin, and the expatriate American Post-Impressionist James McNeill Whistler, who became his artistic mentor; they worked together closely from 1883-87. Menpes’ portrait etchings were quickly recognised and established his career. From that time, he established an artist studio away from London, in Brittany, and worked there leading up to his regular exhibitions. He was committed to his classical, naturalistic inclination, and may well have worked on many occasions from photographs, a medium for which he maintained enthusiasm. He produced most of his paintings through this period, later abandoning it in favour of etching. Menpes became a travel artist who journeyed to exotic locations and then presented exhibitions of work done on location and after his field trips. He was first attracted to Japan, in response to Whistler’s fascination with Japanese aesthetics, spending nine months there in 1887. 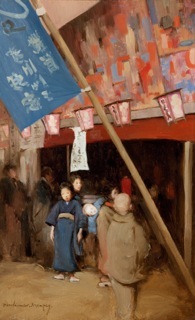 There is a telling painting titled Japanese street scene (1887-88) which shows this plein-air method, and his stylistic and aesthetic affinities not only with Whistler and his temporary mentor in Japan, the artist Kawanabe Kyosai, but also with the contemporaneous Heidelberg School in Victoria. It is a small oil on panel, about 26 by 16 centimetres, showing a number of Japanese people milling outside a shop: one a shaven-headed boy with his back to the artist, a mother bearing a child on her back as she passes by, and a young girl in traditional dress staring at the viewer. Of particular note, apart from the documentary quality of the work, is the treatment of the upper area of the shop-front, which, in isolation, seems to derive from Cezanne’s use of fields of “taches” to model his surfaces and to presage Mondrian’s transitional horizontal/vertical abstractions produced before he engaged with the formal plasticism of De Stijl, some twenty years later. 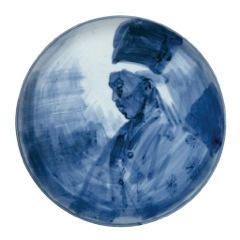 Throughout the 1890s, Menpes travelled to India, Burma and Kashmir; Venice; France, Spain and Morocco; Mexico, China and Japan again, in 1896, with each series of destinations providing material for another solo exhibition. In the lead up to the turn of the century he ceased travelling an portraiture became his chief concern. He created images of society men and women, including writers, artists and actresses such as Mrs Brown Potter and Sarah Bernhardt. Gradually he confined his output to etching, with a series of colour intaglio prints from the late 1890s being of especial interest for their technical accomplishment. Menpes’ studio, in his Mackmurdo-designed house at Cadogan Gardens in Chelsea, became notorious in the press for its extreme Japoniste aesthetic. The interior had been commissioned by Menpes in Japan and it was revealed to the public first in June 1899. Menpes seemed content to promote his radical aesthetic for interior design, but after a decade of such public attention he abandoned this enterprise to pursue his travel books, produced with his daughter Dorothy, and image printing business. Later he became a farmer of fruit and flowers at Pangbourne. During that decade he wrote or illustrated a number of books, including his 1904 biography of the late Whistler (d.1903), with whom he had fallen out around the time of his first trip to Japan, and in 1900 was a special correspondent covering the Boer Warfor a London magazine. In that first decade of the century he produced a series of thirty-eight facsimile old master works, including Leonardo’s Mona Lisa – La Giaconda, Frans Hals’ Laughing Cavalier, and a Rembrandt self-portrait, which he donated to the Government of Australia in 1911. His motivation appeared to be to help provincial Australians connect with the deep history of European visual culture. Two years later he had his last solo exhibition; nevertheless, he continued to produce etchings. As AGSA Director Nick Mitzevich says in the introduction to the book accompanying the exhibition mounted in 2014, compiled by Senior Curator of Prints and Drawings Julie Robinson, Menpes was South Australia’s first internationally recognised artist. The exhibition, and the extremely handsome publication that accompanies it, has secured Menpes’ reputation and place in art history. This article is reproduced in full in A Visual History: the Royal South Australian Society of Arts, 1856-2016 (Volume One), edited and compiled by Adam Dutkiewicz and by published by the society in 2016. This entry was posted in Australian art, Design, Modernism, Uncategorized and tagged Art Gallery of South Australia, James McNeill Whistler, Japan, John Hood, Mortimer Menpes, National Art Training School. Bookmark the permalink. One more element that’s made my stay in Adelaide a very positive experience. Thanks for adding these iconic pictures to your informative review. Thanks for your ongoing interest, Stephen – I keep forgetting about this blog; I intend to add more, but have been caught up on an enormous project – it’s a 350 page volume on the history of the oldest, continuously running art society in the country, the Royal South Australian Society of Arts (est. 1856). This piece on Menpes should be a useful inclusion in the section on the early years of the Society – which amounts to 150 pages!